A puzzling object just discovered in orbit around Earth might be an Apollo rocket on a fantastic journey through the solar system. Sept. 20, 2002: Something odd is circling our planet. It's small, perhaps only 60-ft long, and rotates once every minute or so. Amateur astronomer Bill Yeung first spotted the 16th magnitude speck of light on Sept. 3rd in the constellation Pisces. He named it J002E3. Automated asteroid surveys scan the skies every few weeks, yet there was no sign of Yeung's object earlier this year. "It must have entered Earth orbit recently," says Paul Chodas of NASA's Near-Earth Object Program at JPL. "But it doesn't match any recently-launched spacecraft." In other words, it's a mystery. Could it be an alien spaceship? "If it is," says Chodas, "the aliens aren't good pilots. J002E3 is in a chaotic orbit. It loops around Earth once every 48 days or so, coming as close to our planet as the Moon and ranging as far away as two lunar distances." There's no evidence that the speck is moving under its own power. The orbit is constantly changing because of gravitational perturbations by the Sun and Moon. 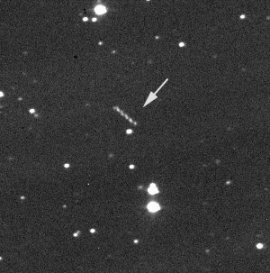 At first Yeung and others thought J002E3 might be a small asteroid--a reasonable guess. The object is as bright as a 30m-wide space rock and it's moving about as fast as an asteroid should move. Mars and Jupiter have captured asteroid moons before; perhaps Earth had done the same. It was a good idea, except for the paint. That's what University of Arizona astronomers found on Sept. 12th when they measured the spectrum of sunlight reflected from J002E3. "The colors were consistent with ... white titanium dioxide paint--the type of paint NASA used on Apollo moon rockets 30 years ago," says Carl Hergenrother, who conducted the study with colleague Robert Whiteley. So, J002E3 might be a spacecraft after all--an old one from Earth. Where has it been all these years? "Orbiting the Sun," answers Chodas. "I've traced the motion of J002E3 backwards in time to find out where it's been," he explains. Apparently, J002E3 left Earth in 1971, went around the Sun 30 or so times, and came back again. Chodas, a expert in planetary motion who has seen plenty of complicated orbits, says "I've never seen anything like this." At first glance, J002E3 would seem to be from Apollo 14. That mission began in January of 1971, and according to Chodas' calculations J002E3 broke out of Earth orbit in March of the same year. There's a problem, though: NASA has accounted for all the big pieces of the Apollo 14 spacecraft. None are missing. Chodas inventories the mission: On Jan. 31, 1971, a Saturn V rocket blasted off from Florida with Al Shepard, Ed Mitchell and Stuart Roosa inside. Two stages of the rocket fell back to Earth when they exhausted their fuel. A third stage, the S-IVB fuel tank and rocket engine, which propelled the crew from Earth-orbit toward the Moon, was likewise discarded. The S-IVB, however, did not fall back to Earth; it hit the Moon. Ground controllers guided it there on purpose to provide an impact for lunar seismic monitoring stations. The lunar module Antares was also deliberately crashed--more data for the seismic network. The command module Kitty Hawk returned the crew to Earth. J002E3 couldn't be any of those things. "There is an outside chance that it might be one of the Spacecraft-Lunar Module Adapter (SLA) panels," adds Chodas, "although J002E3 appears to be too bright for one of those." 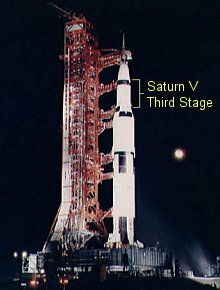 Right: The Apollo 12 Saturn V rocket awaits launch in 1969. Another possibility is that J002E3 is an S-IVB from Apollo 12. Unlike Apollo 14, Apollo 12's S-IVB did not crash into the Moon. The crew jettisoned it on Nov. 15, 1969, when it was nearly out of fuel. Once the astronauts were safely away, ground controllers ignited the S-IVB's engine. They meant to send the 60-ft-long tank into a Sun-centered orbit, but something went wrong; the burn lasted too long. Instead of circling the Sun, the S-IVB entered a barely-stable orbit around the Earth and Moon "much like the current orbit of J002E3," notes Chodas. Eventually, the Apollo 12 S-IVB vanished--no one knows when. Perhaps gravitational tugs from the Sun and Moon accumulated until they nudged the engine away from Earth in 1971. In this scenario, it would have circled the Sun for 31 years until it was re-captured by Earth's gravity in 2002. "It's plausible," says Chodas, "but still speculative." Whatever J002E3 is, it's taking a fantastic journey through the solar system--and it's not done yet. Chodas' calculations indicate that J002E3 will leave Earth again in June 2003 to resume its orbit around the Sun. "Thirty years from now," he notes, "it might come back again." For now the best we can do is watch J002E3 from afar--an unresolved speck of light easily detected by 8" to 10" telescopes with CCD cameras. This week J002E3 is gliding through the constellation Taurus. Where will it go next? Find out by visiting JPL's Near-Earth Object Program web site, which offers a helpful ephemeris for observers. J002E3 won't be here long, so catch it while you can! Editor's note #2: Could the Hubble Space Telescope take a picture of J002E3 and see what it is? No. With its 2.4 meter diameter mirror, the smallest object that the Hubble can resolve at the Moon's distance is about 80 meters across. J002E3 is no larger than about 30 meters if it is an asteroid or 20 meters if it is an S-IVB--too small for Hubble. Editor's note #1: Earlier this week, Chodas noted that J002E3 might hit the Moon in 2003. The odds he estimated were 20%--a figure which was widely reported. The odds have since declined. His latest calculations indicate that J002E3 has less than a 1% chance of hitting the Moon before June 2003, and no chance of hitting Earth. Even if J002E3 did hit Earth, notes Chodas, it wouldn't reach our planet's surface. "The object would completely disintegrate in the atmosphere as a beautiful fireball." Regarding the possibility of a lunar impact, University of Arizona professor Jay Melosh explains that J002E3 is not traveling fast enough to create a bright fireball if it hits the lunar surface. "More likely," he says, "the impact would produce a glowing infra-red cloud like the one astronomers observed when the Japanese Hiten spacecraft hit the Moon in 1993." NASA Near-Earth Objects Program -- (JPL) up-to-date information about near-Earth Objects including asteroids, comets, and misfits like J002E3. How does J002E3 jump back and forth between a Sun-centered orbit and an Earth-centered orbit? "It moves through the L1-point," explains Chodas. Also known as "the 1st Lagrangian point," the L1 point is a location in space 1.5 million km closer to the Sun than Earth. Objects placed there in a circular orbit will move around the Sun in exactly one year--always directly between our planet and the Sun. The Solar and Heliospheric Observatory, for example, is a spacecraft that lives at the L1 point. It enjoys a continuous view of the Sun, 24 hours a day, 365 days per year. Objects closer to Earth than the L1 point are controlled by Earth's gravity. Objects beyond the L1 point are controlled by the Sun. "When J002E3 came close to the L1 point in April 2002, the object passed throuhgh L1--like a portal--from a Sun-orbit to an Earth-orbit. At some time in the future it might leave Earth-orbit in the same way, back out through the L1 point."